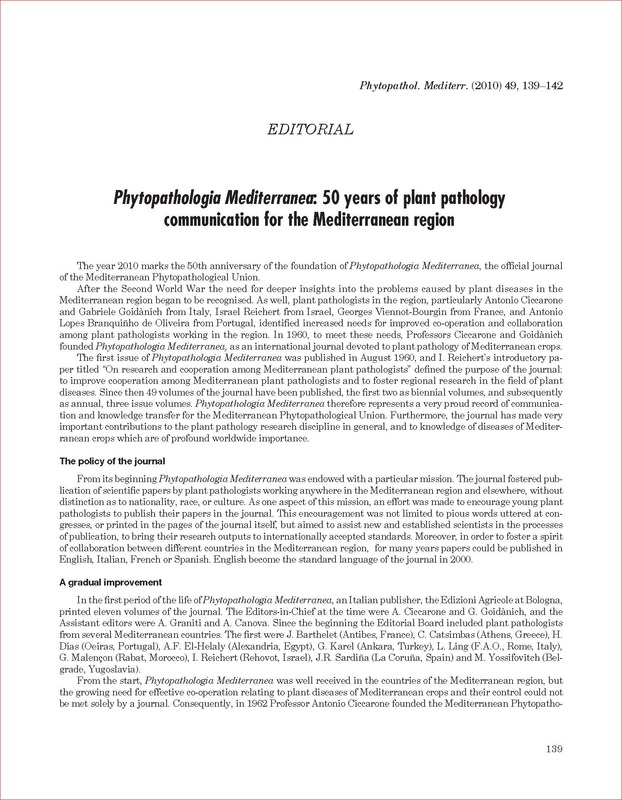 The year 2010 marks the 50th anniversary of the foundation of Phytopathologia Mediterranea, the official journal of the Mediterranean Phytopathological Union. After the Second World War the need for deeper insights into the problems caused by plant diseases in the Mediterranean region began to be recognised. As well, plant pathologists in the region, particularly Antonio Ciccarone and Gabriele Goidànich from Italy, Israel Reichert from Israel, Georges Viennot-Bourgin from France, and Antonio Lopes Branquiñho de Oliveira from Portugal, identified increased needs for improved co-operation and collaboration among plant pathologists working in the region. In 1960, to meet these needs, Professors Ciccarone and Goidànich founded Phytopathologia Mediterranea, as an international journal devoted to plant pathology of Mediterranean crops. The first issue of Phytopathologia Mediterranea was published in August 1960, and I. Reichert’s introductory paper titled “On research and cooperation among Mediterranean plant pathologists” defined the purpose of the journal: to improve cooperation among Mediterranean plant pathologists and to foster regional research in the field of plant diseases. Since then 49 volumes of the journal have been published, the first two as biennial volumes, and subsequently as annual, three issue volumes. Phytopathologia Mediterranea therefore represents a very proud record of communication and knowledge transfer for the Mediterranean Phytopathological Union. Furthermore, the journal has made very important contributions to the plant pathology research discipline in general, and to knowledge of diseases of Mediterranean crops which are of profound worldwide importance. From its beginning Phytopathologia Mediterranea was endowed with a particular mission. The journal fostered publication of scientific papers by plant pathologists working anywhere in the Mediterranean region and elsewhere, without distinction as to nationality, race, or culture. As one aspect of this mission, an effort was made to encourage young plant pathologists to publish their papers in the journal. This encouragement was not limited to pious words uttered at congresses, or printed in the pages of the journal itself, but aimed to assist new and established scientists in the processes of publication, to bring their research outputs to internationally accepted standards. Moreover, in order to foster a spirit of collaboration between different countries in the Mediterranean region, for many years papers could be published in English, Italian, French or Spanish. English become the standard language of the journal in 2000. G. Malençon (Rabat, Morocco), I. Reichert (Rehovot, Israel), J.R. Sardiña (La Coruña, Spain) and M. Yossifovitch (Bel- grade, Yugoslavia). From the start, Phytopathologia Mediterranea was well received in the countries of the Mediterranean region, but the growing need for effective cooperation relating to plant diseases of Mediterranean crops and their control could not be met solely by a journal. Consequently, in 1962 Professor Antonio Ciccarone founded the Mediterranean Phytopathological Union (MPU), as an international society to promote studies and research on plant diseases, stimulate contacts among plant pathologists and facilitate communication and information transfer on plant diseases. In 1973 Phytopatho- logia Mediterranea became the official journal of the MPU and was henceforth printed by the MPU in Italy. The seat of the journal was located at the University of Bari and the editorial work was carried out in collaboration with the University of Bologna, where the Editorial office was based. A. Graniti and A. Canova were the new editors of the journal. In 1996, Antonio Graniti retired from his office and the direction of the journal was taken over by Antonio Canova, Jiménez Díaz and Giuseppe Surico (in 1997), by Jiménez Díaz and Giuseppe Surico (in 1998), and by Giuseppe Surico, with Laura Mugnai as Assistant Editor, from 2000 to 2008. From 1999 the editorial work was established in Florence, which was also where the secretariat of the MPU was based since 1995. With the new millennium and the establishment of the Florence-based editorial team, concerted effort was made to modernise systems and presentation standards of Phytopathologia Mediterranea. The Editorial Board has made changes to bring the editorial processes up to date. In collaboration with Firenze University Press, since 2000 an on-line version of the journal has been established, and the Open Journal System (OJS), has been recently adopted. This is an open access management and publishing system for on-line periodicals, which has greatly improved both accessibility and indexing of the journal. The OJS enables papers to be submitted entirely on line. It is the policy of the journal to ensure that members and readers have the widest possible access to articles as they are published. For this reason a minimal embargo period of 6 months has been established for the latest papers, after which they become freely available on the internet. As a result of these changes, the journal has become internationally freely available, and high standards of research reporting and paper presentation have been maintained. As well, the journal has published topical research, which has applications both in the Mediterranean region but also more broadly throughout the world. This has resulted recently in a rapidly increasing impact factor for the journal. The Thomson Institute of Information (ISI) Impact Factor rating was 0.446 in 2007, 0.559 in 2008, and reached 1.117 in 2009. The structure of Phytopathologia Mediterranea is similar to that of other scientific periodicals. Most of the papers in the journal report laboratory research concerning various facets of plant pathology, as well as field studies of disease epidemiology, pathogen genetics and plant disease management. Particular emphasis is placed on diseases and patho- gens of crops typical of the Mediterranean region, but this is not exclusive. Reviews by expert plant pathologists in particular fields are regularly solicited and published, to take stock of relevant subjects, and report the latest advances that have been made on topical matters. Other sections in the journal include ‘New or unusual disease reports’ informing about new or emerging diseases newly introduced or recorded in the Mediterranean region, and regular publication of proceedings of regional or national conferences, symposia and workshops. 1.5 in the 1960s, reached an average of 3 to 4 in subsequent decades, and continues at a variable average from 3.5 to 5.5. Articles have been submitted from all over the world, with a predominance of papers from Italy, Greece, France, Israel, Spain, Egypt and other Mediterranean countries. The range of countries to which authors belong is now widely increased, and papers from authors not only from countries with Mediterranean climates but also from all continents, have been published in recent volumes. In the 50 years of its existence, Phytopathologia Mediterranea has given noticeable contributions towards a better understanding of the full range of factors causing plant diseases, including environmental factors, viroids, viruses, bac- teria, phytoplasmas, fungi, oomycota and other pathogenic agents. (Plant nematodes were more extensively treated by the sister journal Nematologia Mediterranea founded by Franco Lamberti in 1975). Advances in plant pathology have concerned aspects of pathogen taxonomy, systematics, physiology, pathogenicity, virulence and genetics, with studies on epidemiology and pathogeography, as well as on plant disease management and control. Furthermore, papers have been published on physiology and biochemistry of plant/pathogen interactions, including production and activity of enzymes, toxins and other factors of aggression and virulence produced by plant pathogenic organisms. Aspects of resistance of plants to diseases have also been covered in papers. Thus, Phytopathologia Mediterranea has made very significant contributions to plant pathology, with a focus on plant disease problems of the Mediterranean crops. In recent years many contributions have also dealt with general aspects of plant diseases and problems of worldwide interest. Some particular examples are highlighted here as salient contributions in the early issues of the journal published soon after it was founded. Studies carried out in southern Italy on a disease of almond trees caused by Fusicoccum amygdali brought to the discovery of a toxin, the terpenic glycoside fusicoccin and related fungal metabolites. The research on fusicoccin represented one of the first models of an interdisciplinary approach to plant pathology research in a close collabora- tion between plant pathologists, plant physiologists and biochemists. The same kind of approach was later followed and applied to the study of the role played by several other phytotoxins, most of them new, as chemical determinants of syndromes in plant diseases. These included: aspergillomarasmins from species of Colletotrichum infecting olives and – together with fusaric acid – from Fusarium oxysporum f. sp. albedinis, the causal agent of “bayoud” of date palms; seiridins and cyclopaldic acid from species of Seiridium causing cypress cankers; some derivatives of malseccin pro- duced by Phoma tracheiphila, the fungus of citrus “mal secco”; and several bacterial toxins, such as syringopeptins and syringomycins produced by species and pathovars of plant pathogenic Pseudomonas. Viruses and viral diseases of plants have been recurrent subjects in the journal. These have included the first articles by virologists from various Mediterranean countries, and the series of articles on virus diseases of herbaceous and fruit trees and their causal agents. These studies have been instrumental in the further development of virological studies in Italy and the Mediterranean. Of the 90 articles published in the journal up to 1963, 43 (almost 50%) dealt with plant virology and 47 with fungal and bacterial and fungal plant pathogens. A number of unknown viral diseases and their associated infectious entities, either viroids or viruses, were investigated or described on economically impor- tant crops including grapevine, olive and citrus. Particular attention was given to particular fungal diseases widespread in the Mediterranean region. Research on the “eye spot” disease of olive leaves caused by Fusicladium (Spilocaea) oleagineum included studies on the subcuticular habit of the pathogen and its ecological adaptation, on defence mechanisms of the host, as well as on epidemiological aspects of the disease in different Mediterranean countries. Ultrastructural observations on pycnidia of Phoma tracheiphila contributed to clari- fying the systematic arrangement of this species, which causes the destructive “mal secco” disease in several Mediterranean countries. The most severe diseases of durum wheat in the warm areas of the Mediterranean, i.e., rusts (especially the leaf rust by Puccinia recondita) and certain soilborne diseases (foot rot and take-all) caused by species of Fusa- rium and Gaeumannomyces were extensively investigated, and management strategies were developed. Special at- tention was given to Fusarium head blight of wheat and problems caused by Fusarium mycotoxins in grain. Papers on bacterial diseases were first published in the 1960s, with the first report on fireblight of pome trees (caused by Erwinia amylovora) in Egypt and other Mediterranean countries. In the same years, a series of studies on the ecology of plant pathogenic bacteria was published, initially focusing on the response of plants to bacterial infection in accordance with the notion of the individual effective dose as compared with the notion of independent action. In the last two decades, Phytopathologia Mediterra- nea has devoted space to grapevine wood diseases, and in particular to “esca”. This complex of diseases has caused serious losses to vineyards in all Mediterranean countries, and, to different extents, in all other grape-growing areas of the world. The journal published several issues fully dedicated to the subject, after the usual, careful peer review process of selection of papers presented at the Workshops promoted by an international council of experts (International Council on Grapevine Trunk Diseases, ICGTD). The very active research on this field has resulted in the journal becom- ing a reference publication for research on grapevine diseases carried out in almost all grape-growing countries of the world. The journal is now directed by Laura Mugnai, from Italy, and Richard Falloon, from New Zealand, which is testimonial to the International focus and expanding scope of the publication. The structure of the Editorial Board has also changed, including now a large group of Editors from throughout the world (33 Editors from 17 different countries) who are specialized in all fields of plant pathology. These include epidemiology, disease management, biochemical and physiological aspects, molecular biology, and expertise in fungi, bacteria, phytoplasmas, viruses, viroids, nematodes and other plant pathogens. This also now gives greater attention to research on mycotoxins, biological and integrated management of plant diseases, and to the use of natural substances and plant pathogens for weed control. cycles and severity of plant pathogenic microorganisms. Predicted climate changes will require considerable plant pathology input to provide full understanding of the resulting impacts. Current knowledge of microbial life cycles and development of pathogen populations will need to be revised, and traditional strategies for crop and forest protection will need to be adapted, to cope with changing climate. In these tasks, Phytopathologia Mediterranea, the Mediterranean Phytopathological Union and constituent country phytopathology organisations will have key roles to play, in knowledge transfer and communication. A large group of dedicated researchers has used the sentiments as in these statements as continuous incite- ment to search for improvements throughout the 50 years of life of the journal. Phytopathologia Mediterranea has achieved these aims, and will continue to serve the MPU and international plant pathology into the future.